I have been coaching Junior racers for about a year and a half. Some coaches will not touch the kids that make the future of our sport because of the maturity levels. I have found that Juniors can be a pleasant surprise to coach. Yes, they are young and have alot on their plates with school, training, other activities, and friends, but helping them find the balance in their life and see the light bulb come on is priceless. I really get alot of joy out of seeing a junior athlete accomplish their goals in cycling and still excel in other parts of their lives. Even if you are not a coach, mentor a junior today! The rewards go both ways. 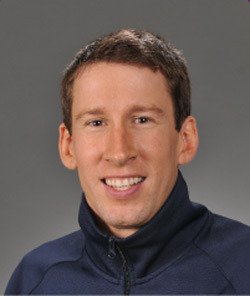 American coach Andy Sparks was previously best known as the coach (and now husband) of multiple world and US champion Sarah Hammer, as well as being the head track coach at the UCI World Cycling Center. He was also U.S. Olympic Track Cycling coach for Beijing 2008. 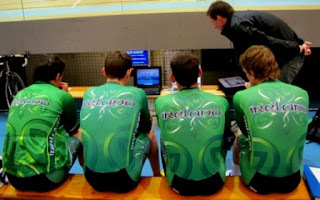 However from last August he has been coaching the male riders on the Irish track team, and giving his advice and input to women’s coach Brian Nugent. Since coming on board there have been very positive signs, with the various riders showing good improvement. A team of five have travelled to the second round of cycling’s World Cup in Cali, Columbia, which begins today and runs until Saturday. Martyn Irvine and Felix English will do the Omnium and scratch races respectively, while Jennifer O’Reilly, Caroline Ryan and Ciara Horne will do the women’s team pursuit. O’Reilly will also ride the Omnium, while Ryan will do the individual pursuit. Sparks is a two time winner of the USA Cycling Coach of the year and his guidance has earned twenty World Cup medals and six world championship titles for his riders. That experience puts him in a very good position to be able to assess the Irish competitors he is overseeing, and he believes that there are grounds to be optimistic. The rider that seems to excite him most is Martyn Irvine, who he describes as one of the most naturally talented riders he has ever worked with. English is seen as a very focussed rider who he expects to be successful, while he is encourage by the women’s improvement and believes that they should continue to progress. Sparks spoke to Irishcycling.com in recent days and commented at length about the riders on the team and his short and long term expectations. He believes that Irvine and English can both go top ten in Cali, and that the women’s pursuit will achieve a time of 3 minutes 33 seconds or faster. Looking further ahead, he expects more improvement in terms of results, and believes that at least some of the team can successfully qualify for the next Olympic Games in London. Shane Stokes: Which of the Irish have you been working most with, and where has that work been done? Andy Sparks: When I first accepted the head coaching position for Cycling Ireland in August, it primarily was focused on the men's team pursuit team. Unfortunately after Matt Brammeier signed a contract with HTC-Columbia, David O'Loughlin decided to focus on family and business and Marcus Christie was on the sidelines due to injury, it sort of spelled the end of the project on the short-term. Some positives to come out of the decision were the ability to really focus on an event that Cycling Ireland could not only be a participant at during the 2012 Games, but a player at and a legitimate medal hopeful. Out of this refinement we were left with two key male riders; Martyn Irvine, who is our team captain, and Felix English, who is our development omnium rider and who has also turned some heads recently by beating a pretty good British sprinter [Chris Hoy] at the European Champs. Both of these riders are champions. Martyn has absolutely every ingredient needed for success on the short-term and long-term and he will be a rider to watch over the next 2 years. He is both an exceptional races and trainer and we have given him the nickname: The Irish House of Pain. Felix is an exciting young bike rider who is just finishing up his Junior career now. Felix is a very focused and professional bike rider who will be successful in the sport as he will not let anything stand in his way. The project has already been rewarding but I also got really lucky with inheriting so many talented bike riders. Both the former coach Tommy Evans and current women's coach, Brian Nugent, did a great job of developing and recruiting the Irish talent. My job is to now expose the squad to both the highest level of training and the high standard, needed in every category, to be successful at World and Olympic level. And I'm very happy to report that we are making major gains towards this goal. SS: What sort of progress have you seen from each of the main riders (ie those going to Cali)? AS: We are seeing gains in all three parts of the Irish track program: Men's Omnium, Women's Omnium and Women's Team Pursuit. Martyn Irvine, our top omnium rider, finished 9th at the European Championships which is a very good indicator that he has a great shot of qualifying for the London Games (through 12 Olympic points-earning races over 2 years the top 8 European team qualify spots for London). Martyn is incredibly talented and we will be seeing quick and continued gains from him as he is very new to the mass-start racing and will really come out of every race a new and better bike rider. Martyn is one of the most naturally talented bike racers I have ever worked with. Jennifer O'Reilly is currently our top omnium rider on the women's side. Jennifer has only been racing her bike for about 18 months (she came from a rowing background) but you would not know that when you see her in the bunch. Jennifer had a very respectable first-showing at the European champs in the omnium and now we just need to get her stronger and fitter, which will happen as she has been working hard towards this goal. Lastly, our women's team pursuit has been making steady progress and are now achieving some respectable times. We have a team goal of 3.33 or faster in Columbia and I really hope, and expect, to achieve it. Brian has been working hard with the ladies for the last year and over the last 3 months I have been providing some guidance and support for the project in the areas where I can offer something. SS: What do you think is possible there? Long-term, I would love to see an omnium World Cup medal in the next 2 years for Martyn. For Jennifer in the omnium, a top 10 at a World Cup would be a fantastic results and for our Women's team pursuit squad a top 5 in the next 2 years at a World Cup would be a great achievement. None of these goals will be easy but if the team continues to work hard everyday in training and have confidence in themselves we will be successful. SS: How do you assess their chances of reaching the Olympics? AS: Our chances of making the Olympics differs for each event. Objectively speaking, if you examine the results from the European Championship it shows that Martyn has a very good chance of making it to London. For the women the next two World Cups will tell a lot. With the new selection procedure put forth by the UCI, European countries have it much harder than in years past on qualifying for the Games. 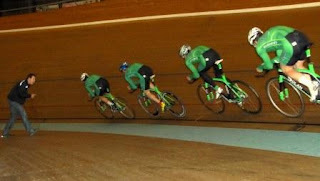 If our Irish women get consistent top 8's in the team pursuit it would look promising to have them lining up in London come 2012.